Having spent 3 hours drawing on the platform (not actually on the platform) at Clapham Common Tube station I had the information and feel of this print down in my sketchbook. I’ve always liked the double sided platform and the old wooden benches that divide the standing area. Everytime a train arrived or left I would be asked similar questions by intrigued commuters and even the platform cleaner came up to take a closer look at what I was doing. 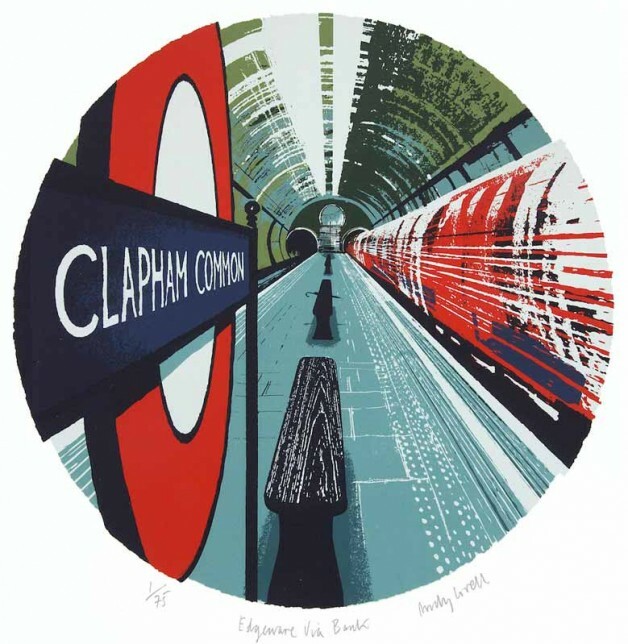 The circular composition of the print echoes the tunnel in which you wait and disappear into as a commuter. The umbrella was left behind by some unlucky Londoner.